There is no way your child could be any happier, right? His or her elation is as high as the peak of the ferris wheel behind you and their smile reaches from ear to ear, revealing a dazzling set of blue teeth dyed from the delicious cotton candy. You look at their glowing face and realize, this is bliss personified. But wait… what was that sound? Your child looks around frantically, hearing the same thing. Among the wind travels a mixture of familiar sounds. The soft clucking of a chicken reaches your ear, followed by the quiet oink of a piglet and the not so subtle bleat of a goat. Oh Lord… a petting zoo! A favorite at parties and festivals for years, petting zoos bring joy to children and their parents alike. There is nothing quite as exhilarating to a child than getting up close and personal to a living, breathing animal, and it’s a lot easier for the parents to explain why they are not allowed to take the animals home (looking at you, adorable puppies). 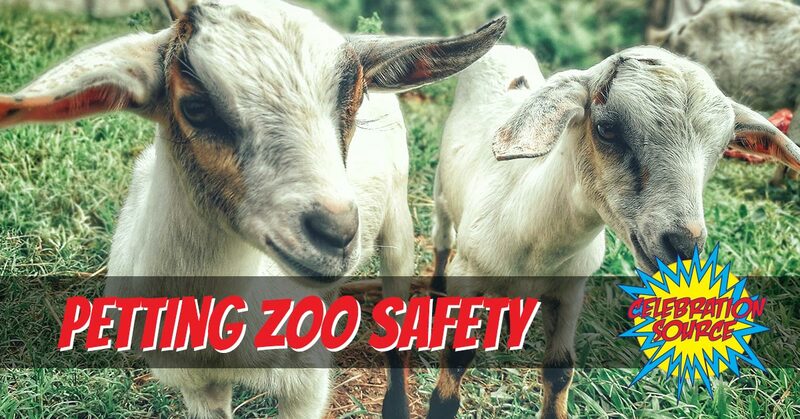 While the petting zoo is a safe, fun experience for the young ones, there are some precautions that we recommend you take before letting th e kids inside the pen. It would be wise to wipe the hot dog and cotton candy residue off your kid’s face before going into the petting zoo or they are going to get a lot more attention from the animals than they probably want. While the critters are very friendly, they are still animals, and animals love food and aren’t very polite when trying to get to it! While the children’s safety is a priority, the animals’ health is another. Candy apples and cotton candy are not a nutritional diet for them and can cause them to get sick very easily. No need to worry though! We provide proper animal treats that you and the kids can hand feed them. Be sure to let the kids know to be careful when feeding the animals and not only will your child be happy, but the animals too! Before sending them in, it’s important to educate the kids about the proper handling of the animals. While they are all very docile, the animals like having their tail pulled or wings grabbed just about as much as we enjoy having our hair violently yanked. Just like we are likely to do, the animals will get angry and retaliate. So for the sake of everyone’s safety and enjoyment, human and otherwise, it is essential to let the children know that the animals are friends and should be treated as such with gentleness and with care. Another helpful hint, let them know to keep their fingers away from the animals mouth or they’re likely to get a sloppy kiss or a bite. We love our petting zoo critters and give them all the care in the world, making sure to keep them well fed and clean. Yet, they are still goats, pigs, chickens, and the like, so give them a little leniency in the hygienics department, eh? It’s very important for anyone going into the petting zoo, even if you don’t touch the animals, to thoroughly wash your hands before and after leaving the pen. This will help prevent animals and kids alike from spreading germs. At Celebration Source, we bring the party to you! We are committed to excellence, superior customer service, and providing South Florida with all of their entertainment and party needs! If your child is a huge fan of animals, we also provide pony rides to make their birthday party or event even more special! Petting zoos and pony rides are only the tip of the iceberg of what we offer. From carnival games and rides to community festivals and corporate events, Celebration Source has what you need to have an extraordinary celebration. If you want to provide your neighbors, company, school, or friends a party they’re unlikely to forget, contact us now! We serve the Delray Beach, West Miami, and Hollywood, FL, areas with our fun carnival and party entertainment, so make your next even the best one yet with Celebration Source!